Areas of expertise - Twentieth century and contemporary literature and theory; cultural studies, internationalization and transnational higher education. Sean Matthews was educated at the Nottingham High School, UK, then read English at the University of Cambridge, where he also gained his PhD, which traced the emergence of Cultural Studies from English Studies in the 1950s and 1960s. He was a Visiting Lecturer at Kyushu University, Japan, between 1995 and 1998, then Visiting Scholar at the University of California, Los Angeles, from 1998 to 2000. Returning to the UK, he worked at the University of Wales, Aberystwyth (2000-2002), and the University of East Anglia (2002-2005), before joining Nottingham as the Director of the D. H. Lawrence Research Centre. 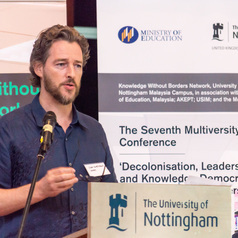 In 2010, Sean was seconded to the University of Nottingham Malaysia Campus as Head of School for the new School of Modern Languages and Cultures. In this capacity, he established – with Professor Christine Ennew – the Knowledge Without Borders Network (KWBN), a ‘think-tank’ for issues around the internationalization of Higher Education. Since arriving in Malaysia, Sean has been increasingly involved in the study of the South East Asian public sphere, with attention to Malaysian cultural politics. Necessarily, working at the University of Nottingham Malaysia Campus, above all in a School of Modern Languages and Cultures, has intensified his concern for the politics of globalisation, particularly in its relation to education - the University of Nottingham Dearing Fellowship (2011/12) gave him the opportunity to explore further these two emergent areas of interest.